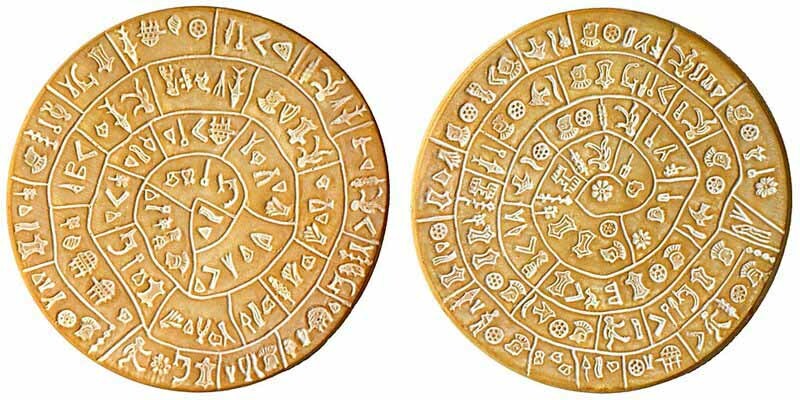 The Phaistos Disk is the most famous ancient artefact ever found on Crete and as Axel Hausmann says, can be considered the world’s oldest ‘printed’ document, dated to around 1700 BC. This is because the characters were created using incised punches, similar in effect to movable type. Another artefact with characteristics remarkably similar to the Phaistos Disk, is the inscribed Magliano Disk, made of lead, which was discovered in Magliano, Tuscany in the 1889’s(ac) . However, the two discs were very far apart in time and location and so similarities are just superficial. Like the Phaistos Disc, the one from Magliano has also presented translation problems as the Etruscan script in which it is written is still only partly decipherable. It was discovered around a hundred years ago by the Italian archaeologist Luigi Pernier (1874-1937) and despite an amazing number of efforts(a) it has defied a definitive decipherment ever since. The interpretations so far have ranged from it being a prayer to a description of the eruption of Thera, while one writer in a light-headed moment went as far as to suggest that it might hold a message from extraterrestrials! Frank Joseph contends[636.42] that it was ‘a sophisticated astrological chart’ and ‘is an example of Atlantean Bronze Age technology’. One of the most fascinating suggestions is that the disk was in fact a board game based on an ancient Egyptian game called Senet(b)(o), which was proposed by Peter Aleff, an explanation later supported by Philip Coppens. However, it seems that this idea was first proposed by Fernand Crombette at least half a century ago(r). Alan Butler, who has written a book on the subject, provides a more conventional offering in which he sees the disk as being primarily an astronomical aid. Rosario Vieni has promoted the idea that the disk had a calendrical use and has published his reasons, in French, on the Internet(c). Paul Dunbavin has also suggested that the disk may have been a spiral calendar[099.181]. Naturally, Atlantis has not been excluded from this wide ranging Phaistos speculation, although the linking of the disk with Atlantis is tenuous at best. Jean Louis Pagé has produced a bilingual offering that combines the Phaistos, Mayan and Aztec disks in an effort to locate Atlantis. Axel Hausmann, writing in German, has also done little to provide a clear connection between Atlantis and the disk. Christian O’Brien and his wife Barbara Joy,in an appendix to their book The Genius of the Few, have identified the writing on the disk as an early form of Sumerian cuneiform writing. The disk is housed in the Iraklion Archaeological Museum which is also home to the Akralochori Axe also found on Crete in 1934 by Spyridon Marinatos, that was inscribed with 15 characters that have been identified with the Linear A script as well as some of the Phaistos characters(e). Two American academic twins, Keith and Kevin Massey, have made available a 72-page pdf file(k) outlining their interpretation of the disk. They concluded that the disk was probably a receipt for goods deposited in a temple. 2008 was a busy year for Phaistos Disk studies. Panagiotes D. Gregoriades delivered three papers to the Atlantis Conference in Athens in which he identified the disk as a calendrical devise used on land and sea. He subsequently published his ideas in book form in 2010 entitled The Creation of Prototypes. In 2008 a major international Phaistos Disk Conference was held in London(h) to celebrate the 100th anniversary of its discovery. The Greek authorities have refused to allow the disk, which is just 16cm across, to be removed for testing, on the grounds of its extreme fragility. The idea of fraud has been suggested because of the lack of other documents ‘printed’ in the same manner and because none of the punches were ever found. Fortunately that argument has now been refuted(u). My own response would be to point out that uniqueness is not necessarily a sign of a hoax. Otherwise, we would have to reject the Antikythera Mechanism, which is also a singular item with no objects of any intermediate sophistication discovered so far. Dr. Marco Guido Corsini, who has also written about Atlantis, has widely promoted his interpretation of the Phaistos Disk(o). Mark Newbrook, who has studied linguistics, gave a good overview of the various attempts to decipher the disk to the 2008 Phaistos Conference. An even more extensive site (currently suspended) was offered by the Georgian mathematician Gia Kvashilavathat includes a very comprehensive bibliography. Kvashilava offers his own interpretation based on the Colchian (Proto-Kartvelian) language printed in the unique Colchian syllabo-logogramic Goldscript. His paper is quite technical and more suited to advanced students of the subject. Reinoud de Jong has now entered this particular fray with a decipherment that he claims offers a description of the religion of Crete(i). Steven Roger Fischer, who claims to have deciphered the rongorongo script of Easter Island has also offered a translation of the Phaistos Disk in his book, Glyphbreaker. By way of complete contrast, Gary Vey claims that the disk is merely some sort of inventory and also gives an overview of the difficulties attached to deciphering the disk as well as some interesting features overlooked by some researchers(j). Stephen E. Franklin has claimed that the Disk is a king-list of Cretan rulers and also that it had a calendrical function(ab). Barbara Gagliano raised a few eyebrows with her claim that the Disk contained DNA information(q)! Late 2014 saw another translation attempt published(s) by Dr. Gareth Owens of the Technological Educational Institute of Crete, in which he claimed that the disk “contains a prayer to the mother goddess of the Minoan era.” Owens’ contribution provoked further controversy including further suggestions that the Disk might be a fake(t). Robert Bradford Lewis has offered a recent forensic study of the Disk, based on his view that the language used was Ugaritic, an long extinct Semitic tongue. (y) However, while the language may be Ugaritic, the script is not! The number of theories relating to the Disk seems to rival the range of speculation relating to Atlantis. My selection here can be fruitfully augmented by the Wikipedia entry(x) on the subject. A list of decipherment claims as well as a useful bibliography up to 2008 is available(y) and Charles River Editors has recently (2018) published two Kindle books offering more information about the many attempts to solve the mystery of the disk.